choir croak out them goodies: Music updates, 'cause there's nothing funny to say about crab. Music updates, 'cause there's nothing funny to say about crab. I'm in New Orleans and massively bored on a terribly rainy evening. Honestly, how much fried crap can one person eat? How many dancing drunks can one dance with? I'm missing Los Angeles. So, here are some L.A.-ish updates on musical things over which to be excited in the coming month or so. 1. One douchey review after another and the Muslims were finally convinced to change their name. So now they are the subject of douchey interviews under new name the Soft Pack. But they're still a ball or two of a live band and they're opening for the Night Marchers (John Reis! Woohoo!) at the Brixton on December 30 (13 bucks a ticket, 100 "J" Fisherman's Wharf, Redondo Beach, 90277). 2. If you're into passively doing good for others, there are a couple of benefit shows happening in Los Angeles this month. On December 21, the Smell will be holding one for the Downtown Women's Center, which is a really fantastic shelter that serves as both a drop-in station and a permanent housing facility for homeless women. More info on the calendar here, but if you can't go (or don't like lady-fronted punk rock), please support the Downtown Women's Center - it's a great transitional space with rehabilitation opportunities, really an ideal shelter, and if you bring an in-kind donation you can take a tour to see exactly who your stuff is helping. 3. Another one, this time snatched from a mass e-mail, is notice of a show being put on by F Yeah Fest, LA Record and the Eagle Rock Music Fest on December 19 (see above flyer). Entrance, Blank Blue & Underground Railroad to Candyland are playing with soon to be announced special guests (though they're claiming a DJ set by Bruce Willis? Hey-o!) at the Center for the Arts in Eagle Rock - 2225 Colorado Blvd., Eagle Rock. 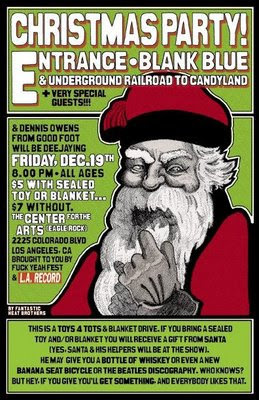 The show is all ages, and tickets are $7, or $5 if you donate a sealed toy or blanket. Toys will be donated December 20 to the Union Rescue Mission and Midnight Mission, and blankets will be cleaned and handed directly to those who come to a Christmas Day dinner (details here if you're on Facebook). Plus, Entrance rocks socks. 4. The Henry Clay People play Spaceland on New Year's Eve and Nightmares on Wax is coming to the Echoplex on February 2 (hurrah hurrah! ).